Orson Welles en 1937 en una fotografía de Carl Van Vechten. -1941: Nominato por Citizen Kane. 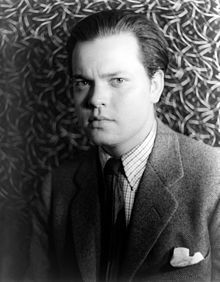 George Orson Welles estió un actor, guionista, director cinematografico y teatral y productor cinematografico estatounitense naixito de Kenosha (Wisconsin) o 6 de mayo de 1915 y muerto en Los Angeles (California, Estatos Unitos) o 10 d'octubre de 1985. En 1941 Orson Welles fue nominato a l'Oscar a o Millor Actor por o suyo papel en a cinta Citizen Kane, estando o propio Welles o director. 1958: The Fountain of Youth. 1974: F for Fake (decumental). 1941: Citizen Kane, d'o propio Orson Welles. 1942: The Magnificent Ambersons, d'o propio Orson Welles. 1951: Le Petit Monde de Don Camillo. 1953: L'Uomo, la bestia e la virtù. 1953: Si Versailles m'était conté. 1954: Trouble in the Glen. 1955: Three Cases of Murder. 1957: Man in the Shadow. 1958: The Long, Hot Summer. 1958: The Roots of Heaven. 1959: Les Seigneurs de la forêt. 1959: Ferry to Hong Kong. 1960: Crack in the Mirror. 1960: The Battle of Austerlitz. 1965: La Fabuleuse aventure de Marco Polo. 1966: Is Paris Burning?, de René Clément. 1966: A Man for All Seasons, de Fred Zinnemann. 1967: Le Désordre à vingt ans, de Jacques Baratier. 1967: The Sailor from Gibraltar, de Tony Richardson. 1967: I'll Never Forget What's'isname, de Michael Winner. 1967: Oedipus the King, de |Philip Saville. 1968: Tepepa, de Giulio Petroni. 1968: The Immortal Story, d'Orson Welles. 1968: Around the World of Mike Todd (voz), de Saul Swimmer. 1968: House of Cards, de John Guillermin. 1968: Kampf um Rom I, de Robert Siodmak. 1969: Kampf um Rom II - Der Verrat, de Robert Siodmak. 1969: The Southern Star, de Sidney Hayers. 1969: Bitka na Neretvi, de Veljko Bulajic. 1969: 12 + 1, de Nicolas Gessner y Luciano Lucignani. 1970: Is It Always Right to Be Right? (corto d'animación, voz), de Lee Mishkin. 1970: A Horse Called Nijinsky (voz), de Jo Durden-Smith. 1970: The Kremlin Letter, de John Huston. 1970: Start the Revolution Without Me (voz), de Bud Yorkin. 1970: Catch-22, de Mike Nichols. 1970: Salvador Dalí (voz), de Jean-Christophe Averty. 1970: Waterloo, de Sergei Bondarchuk. 1971: Malpertuis, de Harry Kümel. 1971: Freedom River (voz), de Sam Weiss. 1971: Sentinels of Silence (voz), de Robert Amram. 1971: A Safe Place, de Henry Jaglom. 1971: Directed by John Ford (voz), de Peter Bogdanovich. 1971: Ten Days Wonder, de Claude Chabrol. 1972: Future Shock (voz), d'Alexander Grasshoff. 1972: Get to Know Your Rabbit, de Brian De Palma. 1972: Treasure Island, de John Hough. 1972: Necromancy, de Bert I. Gordon. 1974: Ten Little Indians, de Peter Collinson. 1974: F for Fake, d'Orson Welles. 1974: The Challenge... A Tribute to Modern Art, de Herbert Kline. 1975: Who's Out There? (voz). 1975: Bugs Bunny Superstar (voz), de Larry Jackson. 1976: Voyage of the Damned, de Stuart Rosenberg. 1977: Some Call It Greed (voz), de Tim Forbes. 1977: Rime of the Ancient Mariner (voz), de Larry Jordan. 1977: The Lions of Capitalism (voz), de Tim Forbes. 1977: Hot Tomorrows (voz), de Tim Forbes. 1978: Mysterious Castles of Clay (voz), d'Alan Root. 1978: Il Grande attacco (voz), d'Umberto Lenzi. 1979: The Late Great Planet Earth (voz), de Robert Amram y Rolf Forsberg. 1979: The Muppet Movie, de James Frawley. 1979: The Double McGuffin (voz), de Joe Camp. 1980: Step Away (voz), de Roberto Ponce y Marcos Zurinaga. 1980: The Greenstone (voz), de Kevin Irvine. 1980: The Secret Life of Nikola Tesla, de Krsto Papic. 1981: Search for the Titanic, de Michael Harris. 1981: The Man Who Saw Tomorrow (voz), de Robert Guenette. 1981: History of the World: Part I (voz), de Mel Brooks. 1982: Butterfly, de Matt Cimber. 1982: Genocide (voz), d'Arnold Schwartzman. 1982: Slapstick (Of Another Kind) (voz), de Steven Paul. 1983: Where Is Parsifal?, de Henri Helman. 1983: Hot Money, de Zale Magder. 1984: The Road to Bresson, de Leo De Boer y Jurriën Rood. 1984: The Enchanted Journey (voz), de Yakikoto Higuchi. 1985: Almonds and Raisins (voz), de David Elstein y Russ Karel. 1985: The Transformers: The Movie (voz), de Nelson Shin. 1987: Someone To Love, de Henry Jaglom. Se veigan as imáchens de Commons sobre Orson Welles. (en) Orson Welles en IMDb.